For this post, I decided to go personal. I will share with you an emotional story with as big a HEA as in Fate Accompli, my debut contemporary novel which you’ve been kind enough to host today. I never thought I could write. Apart from teaching, I also translated fiction for a living and that meant twisting words in my language (Greek) to give new life to an English-speaking author’s vision. However, the vision was someone else’s, not mine. In 2009, after numerous painful and intrusive efforts to get pregnant and finally expecting, I was geared toward motherhood with my whole being focused and primed to receive the greatest gift ever. That summer, I was lost, without purpose and facing what I later learned is termed “dissociation” or detachment from one’s surroundings. I had been a teacher for years, but teaching held no appeal to me anymore. What’s worse, losing the hope of motherhood, turned getting in touch with my feminine nature into an unfair struggle. Nothing could hold my interest, I stopped working and even speaking was an unpleasant task. But quitter I am not, so while I was on paradise on earth—a beautiful Greek island, whose beauty was nevertheless lost on me—I decided to step out of the box. Change gears. Steer myself toward an unknown direction. Seeing love blooming around me as couples on holiday tend—and should—put it on display, I started writing about love, what it does to your heart and your body, tapping on emotions I had allowed to hibernate for too long. It wasn’t easy. Finding my own voice after years of adapting it to express other writers’ thoughts was a challenge. Investing my heroine with a healthy sexuality wasn’t cakewalk either, but making her express herself and explore her needs gradually brought down the walls I had meticulously built up without even realizing it. That’s how Fate Accompli was conceived, and in an epic and triumphant HEA-style ending, by the time it came to the world last November, my life had already been graced with a rosy-cheeked, plump-footed presence that made every other dream fade in comparison. My daughter. In Greek we use the expression “Along with Athena (the ancient goddess) move also your hand” meaning don’t wait for things to happen; make them happen for you. No one wields magic wands and wishing or even praying might be wise, but sometimes you need more. Break your mold, tread uncharted water, do the unthinkable. And then sit back and watch magic happen. MM Jaye’s mother claims that she spoke her first word at the age of six. Months. As a kid she would record fairytales in her own voice, play them back and then re-record adjusting the pitch and tempo. Later, she used her voice to inspire young adults and teach them the art of translation. But there came a time when life took a turn for the worse, and her voice temporarily died out. That’s when she turned to writing. 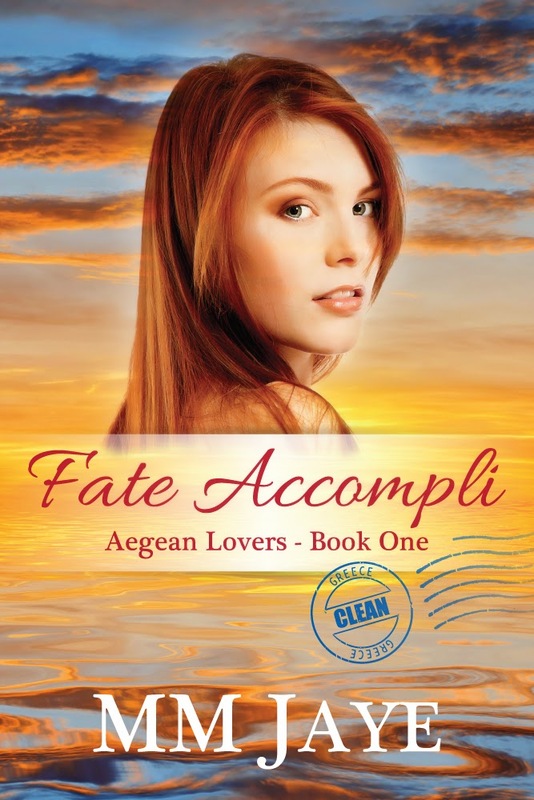 Fate Accompli is the first book in her Aegean Lovers series, set on the Greek island where her husband proposed. MM Jaye lives in Athens, Greece, with her husband, daughter and Kindle. Yes, it’s that important. Thank you very much for hosting Fate Accompli today!